In one of these stunning mermaid dresses, add a touch of Hollywood glamour to your next black-tie formal event. Shop this collection of mermaid formal dresses and long evening gowns with elegant mermaid skirts that contour the body from bust to the knee before flaring out to the hem. You will find classic mermaid-style evening gowns, as well as trendy two-piece formal dresses with mermaid skirts. If you’re going for a glamorous, red-carpet look for your next formal event, a mermaid-style evening gown is the ideal choice! Choose one of these breathtaking mermaid dresses for your next gala, wedding, military ball, or other formal occasion. Why Wear a Mermaid-Style Evening Gown? 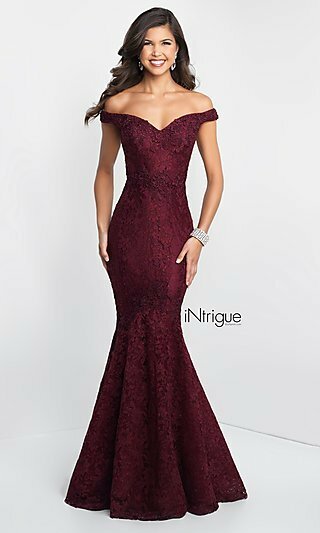 Because of it’s fitted structure, a mermaid dress smooths over the hips and waist before flaring out dramatically around mid calf to create a flattering hourglass figure. The shape of a mermaid dress has a slimming effect that makes it a winner for all body types. A close cousin to the mermaid-style dress, the trumpet dress fluffs out at a higher point above the knees, but is still just as figure-flattering. Highlight your shapely silhouette in a cut-out women’s formal dress with mermaid skirt, a sensual illusion mermaid-style evening gown, or an alluring open-back mermaid formal dress. Paint a picture of grace and sophistication in a form-fitting jersey evening gown with a elaborately detailed high neckline and tiered mermaid skirt. A trendy two-piece mermaid gown or colorful print dress will also cast you centerstage at your next formal affair. Whether you choose a v-neck or a sweetheart neckline, these mermaid dresses are sure define your curves. Dazzle the crowds in a sophisticated off-the-shoulder mermaid dress or glamorous long-sleeve mermaid gown. If you prefer a sleeveless look, you’re sure to love the options available, from one-shoulder mermaid dresses to high-neck formal gowns with chic cap sleeves. Want a romantic look for your special event? Try one of the mermaid dresses accented with bows, delicate lace, intricate embroidery, or feminine ruffles. For a fun flirty youthful vibe, slip into one of the strapless sweetheart mermaid dresses that feature jewel-embellished bodices, trendy necklines, and trumpet or mermaid skirts. Whether you prefer a classic lace style for your mermaid dress or a sparkling sequin mermaid dress, you’re sure to find a sensational mermaid formal gown that will highlight your curves and show off your own personal style at Simply Dresses.